Dividing perennials regularly will ensure healthy, vigorous plants that will continue to perform year after year. It also offers the opportunity to multiply your plants. Dividing stachys. Credit: RHS/Tim Sandall. Most perennials benefit from division every two to three years to maintain health and vigour. If you want to increase the number of plants you have by dividing them, the task can be done more regularly. These are just a few examples of plants that can be divided: Agapanthus, Anemone, Aster, Bergenia (elephant’s ears), Convallaria (lily-of-the-valley) Crocosmia, Dierama, Delphinium, Epimedium, Eryngium (sea holly), Euphorbia, Gentiana (gentian) Geranium, Helianthus, Hemerocallis (daylily), Hosta, Iris, Lychnis, Lysichiton, Lysimachia, ornamental grasses, Primula (primrose) Ranunculus (buttercup), Salvia, Sedum, Verbena, Zantedeschia (arum lily). Plants can be divided successfully at almost any time if they are kept well-watered afterwards. However, division is most successful when the plants are not in active growth. Plant divisions as soon as possible and water them in well. 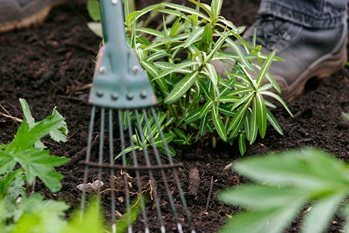 They can either be replanted in the same spot, taking the opportunity to mix in a little garden compost or other soil improver first, or moved to a new part of the garden. Alternatively, pot up individually to build up size, overwintering pots in a frost-free environment. Here are three plants that benefit from using slight variations on the basic techniques. Some crocosmias, such as Crocosmia ‘Lucifer’ and C. × crocosmiiflora ‘Jackanapes’, produce underground stems (stolons) which can be detached, along with fibrous roots, to produce new plants. However, it is worth noting that crocosmias flower profusely when crowded, so do not divide clumps too often – every two or three years should be enough. Likewise, dieramas resent disturbance and will take time to flower again after division. There are few specific problems associated with dividing, especially if carried out between autumn and spring. However, ensure that plants don’t dry out while they do re-establish. It is also worth carrying out slug and snails control as these are often problematic pests for perennials.